Name of posts :More than 40 companies are participating in this Job fair. Various openings based on different qualifications are available. 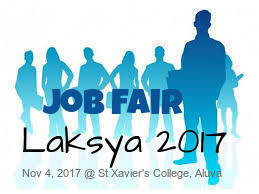 Employability centre, Employment exchange Ernakulam is conducting LAKSYA 2017 Job fair at St. Xaviers College, Aluva on Saturday Nov 4 , 2017. More that 40 companies from various business sectors are participating in this Job fair. More that 1500 job openings are waiting for right candidates. Interested candidates should register there participation at Employability centre - Lakshya 2017 Job fair Candidate Registration page and then attend the Jobfair on Nov 4, 2017, Saturday between 08:00 am to 02:00 pm.